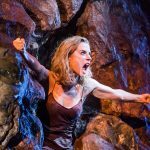 Martin Eve: When I booked to see No’s Knife at the Old Vic – an adaptation of Samuel Beckett’s Texts for Nothing devised and performed by Lisa Dwan – I did kind of know what I was letting myself in for. I’d seen Dwan’s previous performances of Not I, Rockaby, and Footfalls a couple of times and enjoyed them – particularly, actually, Rockaby, despite the notoriously difficult Not I taking all the attention. I’d also seen the press production shots of the dramatic, craggy, dank staging for No’s Knife. What I was expecting was a recital of Beckett’s convoluting, self-erasing prose with minimal dramatic action overlaid, delivered from a series of set-images. To that extent, I was not disappointed. Dwan is a brilliant performer; a striking figure with incredible breath control, stamina, and memory. And it takes all of these to even get through a recital of the pieces in question. At no point was I bored, despite the relative immobility of the pieces and the fact that, in spoken/performed form, it is actually quite difficult to get a handle on the many multiple voices that cross-cut and intersect in the work. “What matter who speaks?” famously asks the second of the adapted set pieces. Well, for an audience at the theatre, perhaps quite a lot. Perhaps in a different way to reading a piece of experimental, self-questioning prose on paper. Perhaps more than No’s Knife was willing to accommodate. I also had some questions about the structure and dramatic decisions. The piece was broken (arbitrarily from my perspective from outside the devising process) into four parts. Why is never quite clear but there was certainly a build towards the final of these set pieces. Indeed, if I had to make judicious cuts, parts I and II could have been dispensed with (even though I like the “What matter who speaks?” text). On the other hand, I’m unsure whether the final climatic piece (an adaptation of Texts for Nothing #4 that was definitely the strongest, with its authorial questioning by the voice that is disembodied, yet here embodied by Dwan) would retain its force without a build-up. I was also unclear why Dwan had such injured legs in the piece but which didn’t seem to cause her any mobility problems, beyond the existential matter of being” unable to leave” that the voice relates. At the same time, some of the voicings and characterisations that Dwan brought to the text went too far for my liking and felt a little contrived (so far as it’s possible for something to feel “contrived” when one has opted to go to the theatre to watch an adaptation of Samuel Beckett prose). Conversely, other staging decisions worked well. The third part, in which Dwan is suspended in an illuminated seated cage mid-way between the ceiling and the floor, hit home with the resonant line “It’s an image, in my helpless head, where all sleeps, all is dead, not yet born, I don’t know, or before my eyes, they see the scene, the lids flicker and it’s in”. It was also enjoyable, within a theatre setting, to have the Texts for Nothing segments adapted that made intertextual reference both to Beckett’s prose and theatre: we encounter Molloy and Malone from the Trilogy, but also Pozzo from Waiting for Godot. We span the stage and the page. Overall, though, No’s Knife makes for curious theatre. Staged prose-poetry recital performance might be a better phrasing. And for some, that will be too pretentious or undramatic. But then, for a piece that lasts an hour and fifteen minutes of continuous verbose monologue that includes the lines “He thinks words fail him, he thinks because words fail him he’s on his way to my speechlessness, to being speechless with my speechlessness, he would like it to be my fault that words fail him, of course words fail him” I’m not sure that No’s Knife failed in any better, or worse, ways than I had hoped. Peter Fifield: My first trip to see a Beckett play since Robert Wilson’s disastrous Krapp’s Last Tape at the Barbican, I had agreed to review this for the Beckett Society newsletter and so been given a free ticket. I’ve worked a lot on Beckett’s writings, but this was to be my first Beckett mission for around a year as I work on other authors. When I arrived at the theatre, though, the feeling of being ‘on duty’ was dissolved by my running into Martin and a couple of other friends. A nice surprise, it brought home the sense of theatre as an event, knowing that I’d have people with whom to share the experience and my thoughts. My only disappointment in this regard was that the performance had no interval. Which, as all theatre lovers know, means no ice cream. In two minds at once, then, my thoughts on Lisa Dwan’s performance were similarly split. I was pleased to see people excited by an adaptation of Beckett’s prose; several audience members standing to applaud her virtuosic performance. But I was also a little disappointed by the adaptation, which didn’t represent the power of Beckett’s work for the theatre, nor, indeed, the experience of reading the Texts for Nothing, from which these were adapted. Beckett’s stage plays for female actors make great play of constriction, stillness and control. Famous images of his heroines, such as the old woman in her rocking chair in Rockaby, Mouth in Not I, and Winnie in Happy Days, all require the actor to be remarkably still. To match this voices often have a muted prosody, monotone coming to dominate Beckett’s theatre. Indeed, Lisa Dwan, having recently performed Rockaby and Not I, must surely know how paradoxically athletic the demands of such a performance are. But here gestures were routinely large: arms were flung up or out, head was thrown back, breasts and stomach were clutched, legs were bandied one moment and stretched another. This willingness to move—as Martin has said, at odds with an apparently injured body—was matched by a series of voices that varied in volume, pace, tone and accent. Switches between these were violent and, while impressive to witness, deeply disorienting. While Beckett was never unduly concerned with his audience’s understanding the vocal acrobatics here gave the impression that these short prose texts, written at the same time as his trilogy of novels Molloy, Malone Dies and The Unnamable, were hard to follow. Two of the four scenes were particularly difficult to understand, and while the torments of a person in such depths of dividing selves and self-doubt are palpable, they were amplified here in the name of spectacle. Where the sufferings of the narrator(s) of the Texts for Nothing are affecting, then, their staging felt ‘played up’. Reading these works, then, is both simpler and more moving. The set designs were striking, Dwan placed in a cleft in a cliff face, in a blasted landscape of tree stumps, and on a high swing, for different monologues. These each chimed with the atmosphere of a Beckett country that I recognise: what Clov in Endgame describes as “corpsed.” What was less clear was why these had been chosen, why there needed to be a range of settings, and so why the different ‘scenes’, which are rather undifferentiated in content, should take place in different locations. For example, when the lights go up on Beckett’s play Happy Days to find the heroine, Winnie, up to her waist in sand it’s a downright weird image. But in the second act she has sunk up to her neck. In two scenes, then, a suggestive pattern has emerged that is a plot in itself. By contrast, here there’s no clear reason why Dwan moves from a cliff, to a bog, to a swing, back to a bog, then out towards the audience, under the illuminated proscenium arch. It seems too much: too various and too non-sensensical. For someone who has specialized in this work, then, my concerns principally gather around the air of unexplained oddness. The settings, the voices, the delivery, I thought all made this work more hostile to the viewer than its source material. There is so little of Beckett’s humour on show that an important and attractive part of the aesthetic is missing. Clearly, many of the audience enjoyed it: some exceedingly so. But I can only think they would really like the stories from which this has been drawn.